Today’s post is a follow-up to the previous articles about caching. I managed to integrate hybris with Nginx (as a reverse proxy) and memcached (as a storage for the cache). The key distinctive feature of this solution is that Nginx works with Memcached directly. You can find all three solutions below. See the explanations of first two approaches in the previous articles on my blog (Page fragment caching and Varnish caching). Nginx is a high performance web/proxy server that powers the most busiest and heavy traffic websites in the world: Airbnb, Discovery Education, Dropbox, MaxCDN, Netflix, TED, WordPress.com, Zynga and much more. It includes caching features for both static and dynamic content, also can be setup as proxy for such backend platforms as hybris. Unlike Varnish, Nginx supports SSL by default. Nginx is a native web server, while Varnish is just a proxy cache layer. People say that Varnish consumes more CPU and RAM than Nginx. Basically because it is an only NoSQL database supported by Nginx. However, there are another strong point as well: Memcached is originally intended for caching. Memcached is a memory storage. It is not persistent. Memcached is a key-value store while the MongoDB is a document store. There is a number of libraries for Java to support memcached. I chose the Java client from Greg Whalin (https://github.com/gwhalin/Memcached-Java-Client/wiki). Basically, for the NGINX configuration, I used you can use anything before “?” sign in the path: it will be ignored. The solution doesn’t imply fetching page fragments separately from the hybris side. There are the same methods as I used for the MongoDB hybris service. In my environment, the hybris uses port #9001 and nginx uses port #39001. You are also need to change worker connections from 1024 (default) to 64. 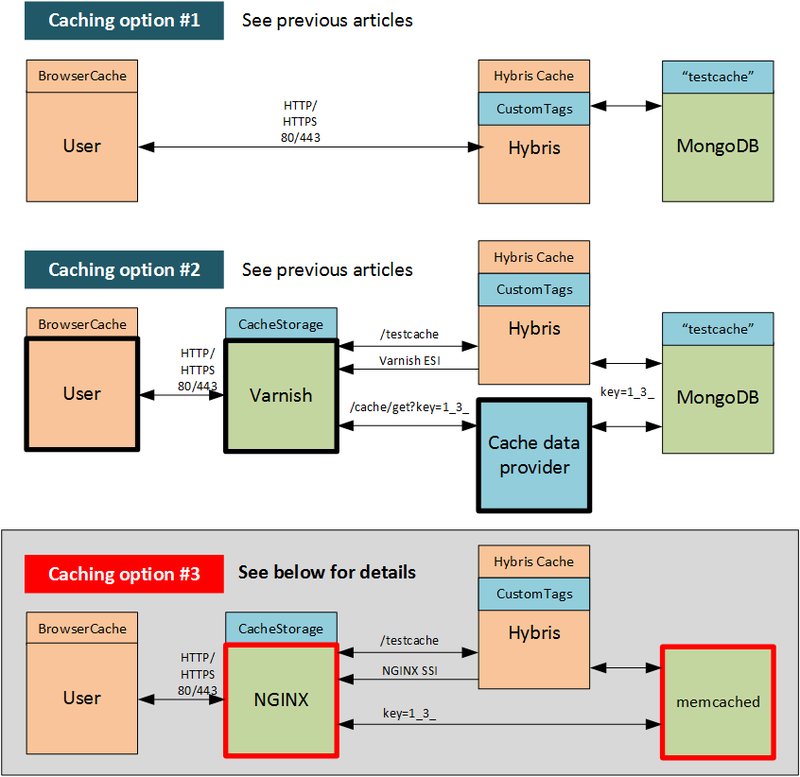 In the Varnish+MongoDB solution, I used caching for the controller pages. In this solution, I decided not to cache these pages at all. The first reason is avoiding repetitions: you can implement this caching in a similar way explained earlier. The second reason is that this type of caching would add an unnecessary layer of complexity to the system. The controller pages set the cookies (session) and these cookies might be used by the components. If you use the cached version of the page, but the session is over, the page won’t be displayed properly. These complexities are common for any type of caching. So I decided to omit this part to avoid creating false illusions of simplicity.